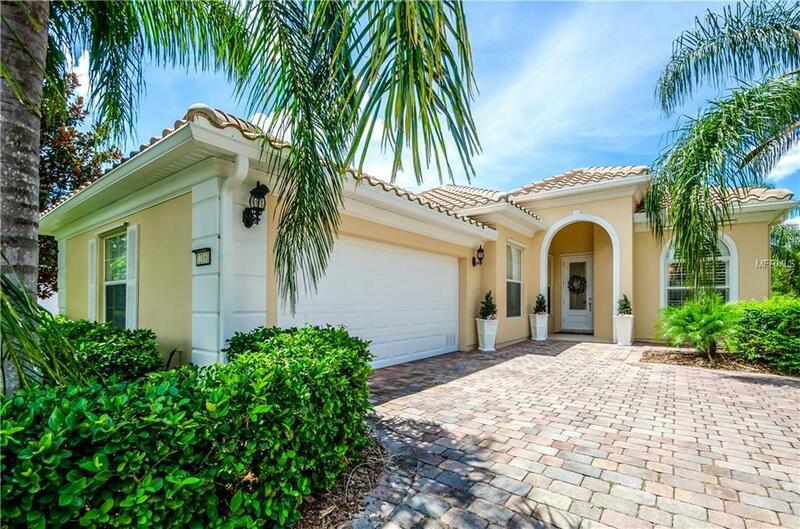 This 3 bedroom POOL home in VillageWalk is an entertainer's dream! This extended Oakmont offers 200 extra square feet where it counts...the family room is enormous with tons of light! With stunning WATER & CONSERVATION views, a sweeping floor plan & high-end amenities, you'll love hosting friends & family in this classic Floridian home or just kick back & soak it in for yourself. Outside, lush landscaping, a brick paver driveway, & terra cotta roof set the tone for luxury. Indoors, silky tile, panoramic windows, and stylish upgrades (like PLANTATION SHUTTERS & crown molding throughout) exude chic sophistication.The kitchen's central layout, service bar and easy access to dining areas make it perfect for hosting guests & family. NEW stainless appliances, elegant granite countertops, maple cabinetry & "sea glass" backsplash add a lavish touch. From the kitchen & extended family room you're steps away from breathtaking views of glistening water & conservation from the screened pool deck. Perfect for family BBQs & summertime soirees!The master bedroom is bathed in light, pouring through its pool-facing windows. The master bath is uniquely "his & hers, and the naturally lighted tub is just luxurious. The owners have made numerous improvements, including wood-like tile floors, pool pump, exterior paint and more. All of this, plus VillageWalk's considerable amenities: like 24 guarded entry gate, nearby pedestrian bridge, sprawling town center, pools, fitness, on-site restaurant and so much more!